Travelers' diarrhea (TD) is the most common illness affecting travelers. Each year between 20%-50% of international travelers, an estimated 10 million persons, develop diarrhea. The onset of TD usually occurs within the first week of travel but may occur at any time while traveling, and even after returning home. The most important determinant of risk is the traveler's destination. High-risk destinations are the developing countries of Latin America, Africa, the Middle East, and Asia. Persons at particular high-risk include young adults, immunosuppressed persons, persons with inflammatory-bowel disease or diabetes, and persons taking H-2 blockers or antacids. Attack rates are similar for men and women. The primary source of infection is ingestion of fecally contaminated food or water. What are common symptoms of travelers' diarrhea? Most TD cases begin abruptly. The illness usually results in increased frequency, volume, and weight of stool. Altered stool consistency also is common. Typically, a traveler experiences four to five loose or watery bowel movements each day. Other commonly associated symptoms are nausea, vomiting, diarrhea, abdominal cramping, bloating, fever, urgency, and malaise. Most cases are benign and resolve in 1-2 days without treatment. TD is rarely life-threatening. The natural history of TD is that 90% of cases resolve within 1 week, and 98% resolve within 1 month. Infectious agents are the primary cause of TD. Bacterial enteropathogens cause approximately 80% of TD cases. The most common causative agent isolated in countries surveyed has been enterotoxigenic Escherichia coli (ETEC). ETEC produce watery diarrhea with associated cramps and low-grade or no fever. Besides ETEC and other bacterial pathogens, a variety of viral and parasitic enteric pathogens also are potential causative agents. 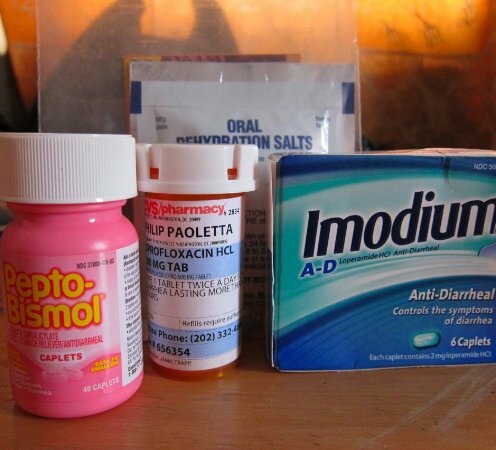 What preventive measures are effective for travelers' diarrhea? Helps protect against occasional diarrhea, abdominal cramps, nausea and bloating. Provides armor for your insides so you have digestive freedom when you eat, drink and travel. Fast, natural and safe. Take one packet each day before you head out on your adventure and eat and drink as boldly as you dare. Works like nothing else for digestive issues - LiveLeaf products deliver the power of reactive plant immunity that helps activate the body s natural healing process.